Paint Louis 2011: Post your Photos To PAINT LOUIS Flickr Group!!! 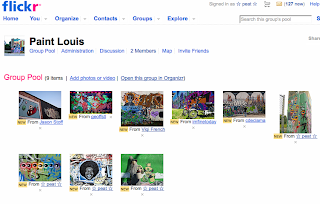 Post your Photos To PAINT LOUIS Flickr Group!!! Do you photo from past Paint Louis Events? Join our Flickr Group and ad some more. If you do not have flickr and want to add photo just send us via e-mail and your photo credit too. Paint Louis 2010 Coming Soon!?!?!?!? !